Weimaraner’s are highly energetic dogs that love to be played with. They like to be surrounded by people and/or other animals. It is also a breed that works well with small pets. Although, they can be overwhelming at times because they can be aggressive if not exercised properly. They learn very easily and can be trained. However, they can also be stubborn from time to time, but once their stubbornness is overcome, the can be extremely well-behaved. Like any dog, interaction only helps a Weimaraner’s personality and is recommended to get decent interaction from people or other animals on a daily basis. Overall, they are a hyperactive, fun-loving dog that would be great for any active family. This is a country dog that need space to live. It requires intense exercise and if it does not get the recommended exercise, it could be very detrimental to its health. These dogs should not be owned by an owner with a very active lifestyle who isn’t home a lot because of their exercise requirements. People who jog, hike, or spend tons of time outdoors are the number one candidates for owning this type of dog. Weirmaraners are very social dogs and should be encouraged to be social. Splitting a Weirmaraner’s time between indoors and outdoors is the most beneficial to the dog’s well being. This allows the dog to get the exercise they need while also giving it the appropriate time to relax. It’s coat is very easy to groom, as it has short hair and only needs brushed occasionally. Some health concerns that may effects Wiemaraners include anything from gastric torsion, spinal dysraphism, chronic hip dysplasia, and distichiasis. If your Weimaraner shows any of these symptoms, it should be taken to a vet immediately for an exam. Hemophilia, hypertrophic, and osteodyrophy areoher concerns that seem to effect this breed negatively. Dwarfism can be found in this breed, and although there is no cure, there are some other concerns that could sprout due to disproportional body size. It is suggested for every Weimaraner to get a hip, eye, and blood test at least every other year. This will help track any changes in your dog’s health and ensure that they are treated for anything that may arise. A Weimaraner typically lives between 10 to 13 years. 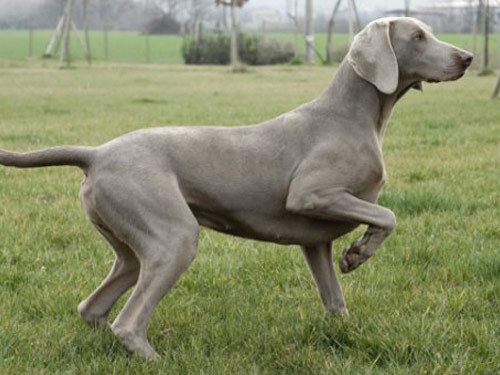 The Weimaraner was initially bred in Germany to attempt to create the ultimate hunting dog. At first, they were intended to hunt game of all shapes and sizes, anything from fish, to rabbits, to deer, to bears. They were originally called Weimaraner Pointers but Pointer got dropped from the name. Although partially derived from the Bloodhound and the Red Schweisshund, the roots of its famous grey fur coat is unknown. At first, Weimaraners could only be sold to club-members of the German Weimaraner Club. The rules of this club were strict and dogs from breeding that was not approved would not be registered and many even had to sadly be destroyed. An American gained entry to this exclusive club and was given the right to take two of the dogs back to America in 1929 and they were recognized by the AKC in 1943.